This week's topics focus on Maurice Harkless' lingering knee injury, Zach Collins' stated desire to be a starter and the most interesting storylines of the preseason. Believe it or not, the NBA season is here already. Where did the summer go? After a humdrum offseason that generated little excitement for Blazers fans, the team is back at it with the first of five preseason games set to tip off Saturday. It's time to check in on the Blazers with another edition of the 3-on-3 Blazers podcast. 1. What are your thoughts on Maurice Harkless still not being fully cleared for practice, six months after he had arthroscopic knee surgery? Nate: It’s a major concern. Last season, we saw how crucial Harkless was to the Blazers success. When he returned to the rotation as a consistent force in the second half of the season, the Blazers were more versatile offensively and defensively. He provides outside shooting to take some of the pressure off Lillard and McCollum, and he’s arguably the best Blazers perimeter defender. In the last 20 games he played, he shot 57 percent from the field and the Blazers went 14-6. If Portland is going to compete in a very tough Western Conference, like they did last season, they’ll need consistent contributions from Harkless. He’s a difference maker who the front office and fans were hoping would make a big stride this season. And this injury, whatever it may be, is hampering his progress. Orlando: This is concerning. Remember, this injury kept him out of the lineup to close out the regular season too. He’s been limited in practice so far and will be one of the top storylines during training camp. Let’s hope his knee gets back to 100 percent. Neil Olshey made it a point to mention how important Harkless is and how his injury affected the way the Blazers ended the regular season. One thing I learned about last season was just how fragile this roster is and missing a player with Harkless’ skillset would be a tough blow to open the season. Let’s hope I’m overreacting and he’s ready to go in the coming week or so. Jared: It was the most surprising news to come out of an otherwise subdued media day. Recovery from arthroscopic knee surgery usually takes six weeks at most. It's been nearly six months. The Blazers are keeping whatever information they have about Harkless’ medical status to themselves. Since we don’t know how long it will be until Harkless is fully cleared to compete in practice, we can only hope he’s better in time for the start of the regular season, which is 22 days away. The early part of the schedule is challenging and it’s important that the Blazers start well this season in a loaded Western Conference. When Portland played its best basketball last season, it was when Harkless was also playing his best. If he can’t go, the Blazers rotation is hard to stitch together. Does Evan Turner start, and if so, what does that do to the second unit? Do you start Zach Collins at power forward and move Al-Farouq Aminu to small forward? Neither option seems ideal. 2. At media day, Zach Collins said he wants to be a starter. Do you see Collins becoming a permanent fixture in the starting lineup this season and do you think that would be a good thing? Orlando: I want my guys to believe they can compete and start. I want to hear Zach Collins say that, if I’m a fan of this team. There’s no doubt the Blazers are banking on Collins becoming a fixture in that starting rotation at some point. He’s got to be able to play with Nurkic, if that’s the case. Can that happen? Eventually, I believe so. Right now, he’s got a lot of work to do if he wants to bump a player like Aminu from the starting lineup. Jared: Good for Collins. You need a high level of confidence to succeed in the NBA and he seems to have it. But I’m not sure he’s ready to start right now. And unless we see massive improvement over last season’s performance, I wouldn’t anticipate him cracking the starting lineup this season. I think because so many of us were encouraged to see him exceed expectations last season, we sometimes lose sight of how pedestrian his rookie campaign was. By every statistical measure, Collins was a below-average NBA player. For example, by real plus-minus, a reliable indicator of overall production level and contribution to a team, Collins ranked 87th among power forwards (fourth-worst in the NBA), 67th among centers (third-worst in the league) and 488th overall (out of 521 players) in the NBA. Not every statistic is as unkind to Collins as real plus-minus, but very few paint him in a positive light. Barring significant injuries, I don’t think Collins should be starting for the Blazers. Nate: I love the attitude. That’s what you want from a former first-round pick and the future of the franchise. And it would be great if Collins played so well that he cemented himself in the starting lineup alongside Jusuf Nurkic. But I don’t see it happening. Coach Stotts has a lot of confidence in Al-Farouq Aminu and is favorable to the Nurkic-Aminu-Harkless-McCollum-Lillard starting lineup. Before we talk about Collins being in the starting lineup, I need to see him fill some of the voids left from the departure of Ed Davis. I want to see Collins compete in the post on both ends of the floor. We saw it defensively last season but not offensively. If Collins can be a consistent inside force off the bench, that fills the role on the court left behind by Davis. 3. What are you most interested in seeing in the Blazers' five preseason games? Jared: Preseason is a time to discover new players. So I want to see as much of Seth Curry as possible. I want to see if he’s healthy and can play without limitations. I want to see if his 3-point stroke is as pretty as advertised. I want to see if he can run the offense and if his exceptional pick-and-roll analytics are as impressive as they appear. I want to see if Nik Stauskas is anything more than a 3-point shooter. I want to see how rookies Gary Trent Jr. and Anfernee Simons match up against real NBA players. Their performances in summer league were nice but this is a whole new level of competition. I’m also interested in seeing how Collins has improved, especially on offense. I trust he’ll be a positive contributor on defense this season, but if he really wants to make a notable impact, we’re going to need to see much more from him offensively. Preseason isn’t a perfect barometer for something like that, but it’s the best we have right now. Nate: I’m like most Blazers fans and am not putting any stock in these preseason games. Of the starters, Nurkic is the one I’ll be watching closest, looking to see if he is finishing stronger at the rim. But among the regular rotation players, this is mainly the same group we saw last season, except for some bench changes. So, I guess that leads me to the battle for role minutes. I’m interested to see Seth Curry coming back from his injury, and if Wade Baldwin continues to show flashes of smothering defense and timely 3-point shooting. The battle for frontcourt rotation minutes between Caleb Swanigan and Meyers Leonard should also be interesting. However, all these observations will all be made with a grain of salt. After last preseason, we were all convinced Swanigan would be a regular contributor. We saw how that played out. Orlando: Probably the toughest question to answer because I don’t care about the preseason. Let’s hope everyone stays healthy, we see the new additions to the roster out there and we get one step closer to the return of the NBA season. If there’s one player I’m curious to see play, it’s Seth Curry. He says he wants to make Dame and CJ’s job easier, let’s see him knock down some shots, run the offense and see how he plays after recovering from a lower leg injury. Submit a question for our panel to answer during the 3-on-3 Blazers podcast by clicking here. 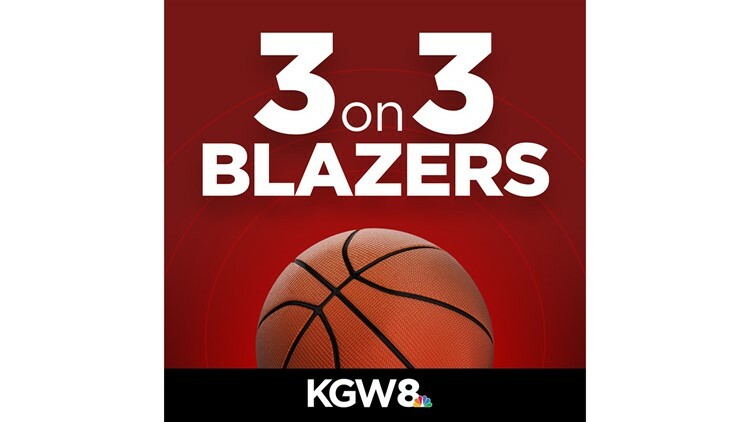 Listen to the 3-on-3 Blazers Podcast each week with KGW's Orlando Sanchez, Jared Cowley and Nate Hanson. Subscribe on iTunes, Podbean, Google Play, SoundCloud and Stitcher.